Click on the question that corresponds to your needs. How long have you been open and training students? How many other schools are training RV technicians now? You say you also certify your graduates, what does this mean? How are you different from other schools who have courses for training RV techs? How often are classes held and how long is the training? Speaking of room and board, are there accommodations and campgrounds close by? If I enroll, how do I know you will not cancel classes as other schools have done? We started our program in Stroudsburg, PA in May of 1986. 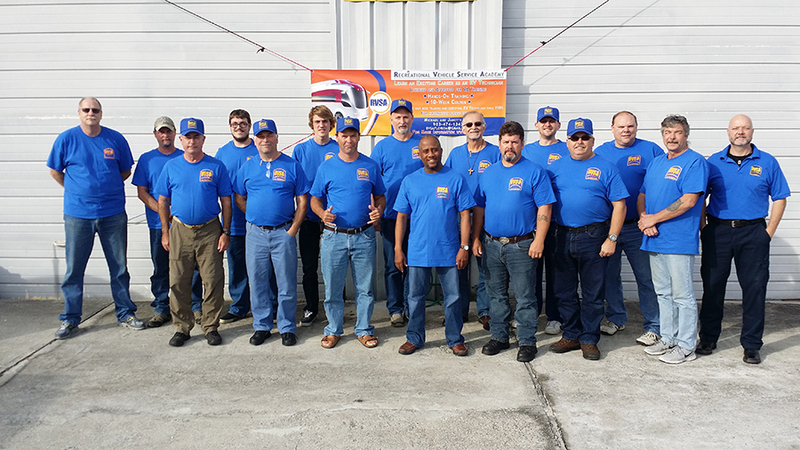 At the time, RVSA was the only school in existence training and certifying RV service technicians. As far as we know, there is only one left other than RVSA. Two RV associations started about 16 schools in community colleges in the mid to late 90s, but there only a few still accepting entry-level students. Our RV technician training program is written in behavioral terms and is kinesthetic or hands-on. There are three ways most people learn – visual, auditory, and kinesthetic. 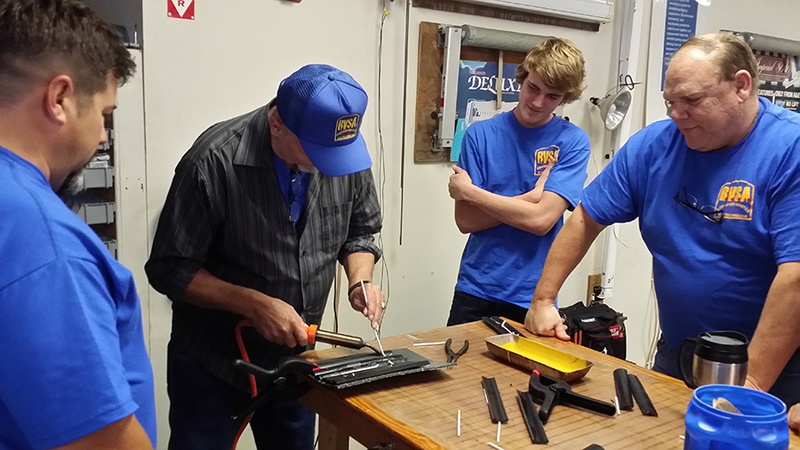 Skills needed to be auto mechanics, physicians, pilots, marine technicians, and RV technicians are taught most effectively with hands-on training. Some people may try to tell you that you can learn this vocation online or through home study. Click here to find out why long distance study is simply not the best way to learn this trade. You say you also certify your graduates. What does this mean? We not only train you at RVSA but certify your performance. Some schools say they offer manufacturer certificates. In nearly all cases, this amounts to a certificate of attendance (Which means they certify that you were in attendance while the lesson was being taught). RVSA certifies that you are capable of performing the repairs and service you were trained to perform. Who recognizes the RVSA certificate? Many dealers and most associations in North America and Canada recognize our certificate. Recreational vehicle dealers such as Lazy Days, Stoltzfus’s, Conley, Harberson-Swanston, Holiday, Bates, RV World, and associations such as FMCA, RVAA, and Georgia ARVC are among the thousands in the RV industry who recognize our standard and Master certificates. Keep in mind that we do not just PREPARE you to take a test, and we do not offer manufacturer certificates of attendance. We actually certify your performance. Most major suppliers and manufacturers have given us a tremendous amount of support. Only several years ago, we received a tractor-trailer from Dometic full of RV accessories. A complete list of the RV suppliers who have donated thousands of dollars worth of components is included on page nine of our catalog. 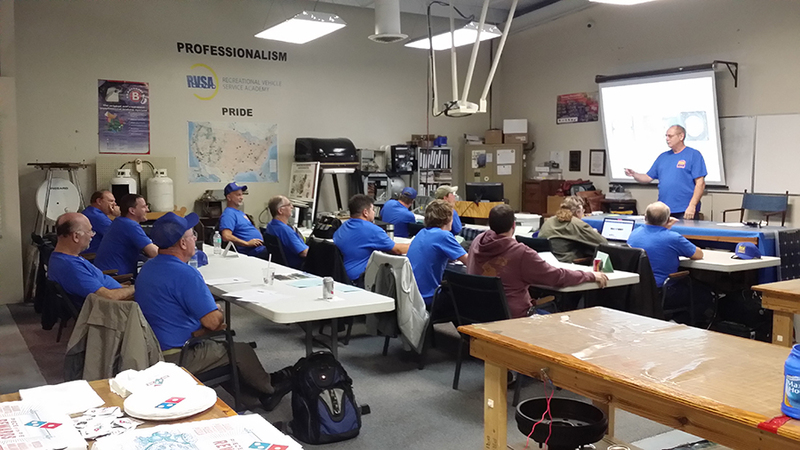 How is RVSA different from other schools that offer courses for training RV techs? A gentleman named Eivion Williams who owned Mohawk Trailer Supply in New York once called us the “Harvard of Trade Schools.” My entire life has been devoted to education. My doctorate degree is in education, and I spent more than 40 years writing, evaluating, and implementing educational programs. I wrote the only RV Technician training curriculum in 1986. The program at RVSA continues to be the most comprehensive in the industry. It is important to note that virtually all other short-term RV Technician Training schools use our curriculum model. Keep in mind that we do not sell and/or install RV parts. We are not part of a large institution offering hundreds of other programs. We are not an RV association with many other interests. All we do is train and certify RV Technicians; that is it, nothing else. According to our graduates and employing RV dealers, we have become pretty good at it. The Recreational Vehicle Service Academy is located about 35 miles south of Tampa, Florida, three and a half miles east of I-75 in a town called Palmetto. Our classroom is 3,500 sq. ft., and the shop comprises 2,500 sq. ft. The building is on one level and offers a climate controlled atmosphere for student comfort while training. We are also handicap-accessible. We have four (4) classes per year; January, March, June, and September. Our complete certification program is 10 weeks, 8 hours per day, and 5 days a week. How much does your RVSA course cost? Our complete tuition, not including a $150 application fee, is $5,996. This fee includes everything except special tools, room, and board. Speaking of room and board… are there accommodations and campgrounds close to the Recreational Vehicle Service Academy? Keep in mind that Florida is a destination state. There are thousands of hotel/motel rooms within three to 20 minutes driving time. There are also many beautiful campgrounds located very close to the school. The closest is only two blocks away and can accommodate recreational vehicles. If I enroll, how do I know that RVSA will not cancel classes as other schools have done? Since opening in 1986, we have never cancelled a class. In the early years, we held classes with as few as one student. Because of our excellent reputation, our classes are growing to the point that we are considering an expansion plan that would include construction of another classroom to handle the demand.